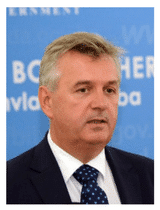 Adnan Smailbegović is President of the Board of Directors of the Association of Employers of Federation of Bosnia and Herzegovina. He is the owner is a company Wood Team doo Ilijas and a member of the Supervisory Board of Prevent Group BiH. Adnan Smailbegović graduated from the Faculty of Mechanical Engineering in Sarajevo. He also completed postgraduate specialist studies at the Faculty of Economics in Sarajevo.